What law and what are European democratic values? The people of Europe never voted for their own replacement, no one had a democratic choice in importing millions of unassimilable Mohammedan savages, and Poles, along with the Hungarians, made it clear that Islam will not replace Europe’s Judeo-Cristian values. Guy Verhofstadt is way out of line. But so are all of the unelected communist apparatchiks that run the EUSSR in Brussels. ACTUAL democracy is called “far right” or “populist” and is to be condemned and dismissed in favour of the former. 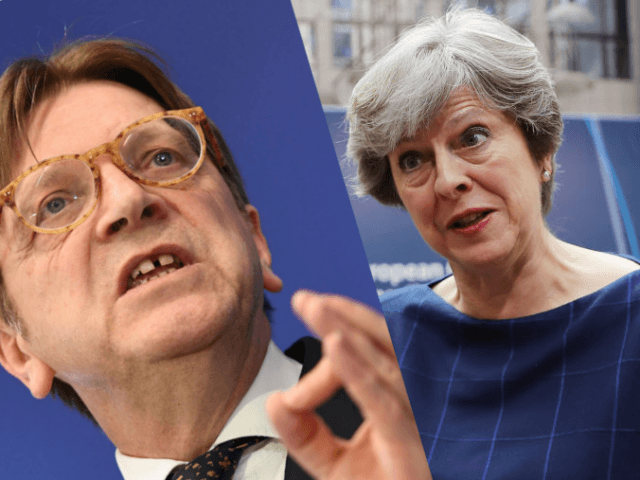 Former Prime Minister of Belgium Guy Verhofstadt told The Telegraph he expects the British premier to demonstrate her country will remain loyal to “European liberal democratic values” — as defined by EU insiders like himself — after Brexit. “The current Polish government is guilty of backsliding on the rule of law and undermining European democratic values,” alleged the 64-year-old MEP. “I hope Theresa May will firmly raise this issue in Warsaw. This visit is an important first test of the UK’s pledge to defend European liberal democratic values, as we move forward together to build a strong security partnership,” he said. Surreal. 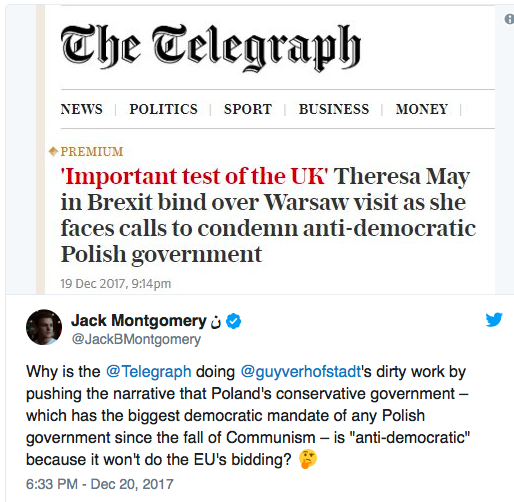 The EU is the largest criminal racket on the planet – and it’s ‘concerned’ about democracy and the rule of law in Poland? What a joke! The influential politician, who has been described as the “high priest” of the “temple of European federalism” by Brexit campaign leader Nigel Farage, has made his move as the European Commission triggers the “nuclear option” in its ongoing struggle to bring Poland’s patriotic conservative government to heel, activating Article 7 proceedings in an attempt to strip it of its voting rights in Brussels. Officially, the Law and Justice Party government — which secured the biggest electoral mandate of any governing party in Poland since the fall of Communism in 2015 — is being taken to task over purely domestic matters, in particular for proposed reforms to the Polish judiciary. The EU claims these reforms represent a threat to “democracy” and the “rule of law” — although Prime Minister Mateusz Morawiecki argues reforms are necessary to undo the “nepotism and corruption” which has become endemic in the senior courts, which were devised by Soviet-backed military dictator Wojciech Jaruzelski before the fall of the old People’s Republic of Poland, and have remained essentially self-governing and self-selecting ever since. Given the EU’s quiet acceptance — or even endorsement — of seemingly more drastic actions, such as Spain’s use of police brutality and criminal sanctions to quash Catalonia’s recent referendum on independence, many critics suggest that the bloc’s real issue with the Polish government is its staunch opposition to attempts to impose migrant quotasacross the continent. While EU mainstays such as France have backed the European Commission on Article 7, with President Emmanuel Macron’s Europe minister declaring “It must be done,”, sanctions will not carry without unanimity — and Hungary’s Viktor Orbán, who takes the same view as Law and Justice on migrant redistribution, has already promised to veto them. Prime Minister Morawicki remains confident he can carry his reforms despite EU interference, stating he is “firmly convinced that sovereign states — and Europe must be a Europe of sovereign states — have an absolute right to reform their judicial systems”. Whether or not Theresa May intends to offer Brussels a symbolic show of support against the Poles in hopes of currying favour remains to be seen. The EU has betrayed the People of Europe. Their mandate has become in substance invalid.